Cast off your smartwatches, forget Google Glass, here cometh the future of wearables. In celebration of Tetris' 30th anniversary, tetromino-fanatic Marc Kerger has developed a playable Tetris t-shirt. It lights up and everything. 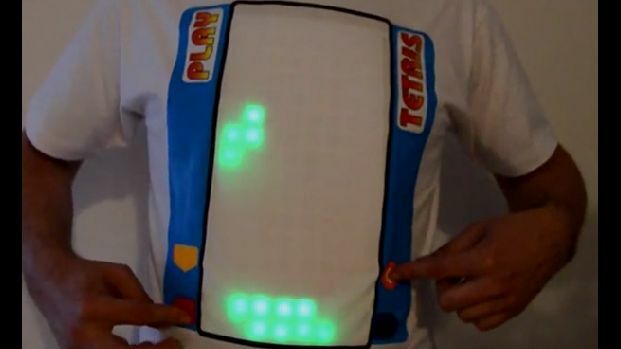 "I always wanted a playable Tshirt, well now I made one myself," says Marc, who created the shirt using an Arduino Uno micro-computer, 128 LEDs, and 4 AA batteries. Not bad, considering the unequivocal awesomeness that this t-shirt represents. Tetris is widely accepted as being one of the greatest video games of all time, and was created in the Soviet Union by game designer Alexey Pajitnov. The game released on the 6th June 1984, and has since sold an estimated 170-million copies.